A vertical ladder extends into Dry Dock 1. Apprentice Nicolas Manfred puts finishing touches on a mold in the Foundry. A grinding tool awaits use on a steel unit stowed on Platen 21. With risers still attached, this newly cast ship component resembles a modern sculpture. Aircraft carrier John F. Kennedy (CVN 79) takes shape in Dry Dock 12. Shipbuilder Alverse Stringfield grinds steel in the Covered Modular Assembly Facility (CMAF). Shipyard bikes wait for their owners as a storm approaches. 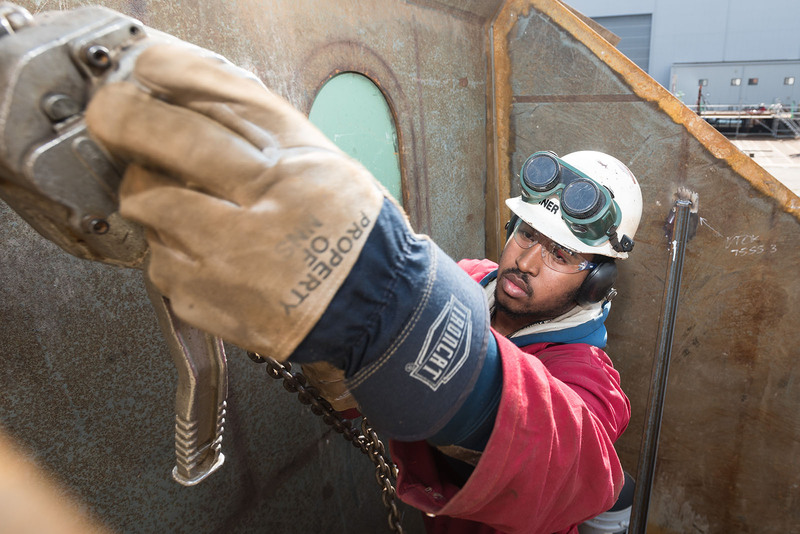 Shipbuilder Larry Turner tightens a chain to a bulkhead while working on a John F. Kennedy (CVN 79) unit. Foundry ladles await the next pour. Shipbuilder Johnnie White fastens a C-clamp to prepare for an upcoming job in the Covered Modular Assembly Facility (CMAF). The elements claim another victim, a rusted and broken stanchion at Outfitting Birth 1 (OB1). In the Modular Outfitting Facility (MOF), Shipbuilder Ryan Adams checks his work to ensure all areas of the component have been painted. Susan Morgan, a Moran tugboat, is spotted in the James River cruising to its next mission. Machinist Dave Hoffman inputs information to a lathe in the Machine Shop. One of Dry Dock 12's cranes is illuminated by morning sun. 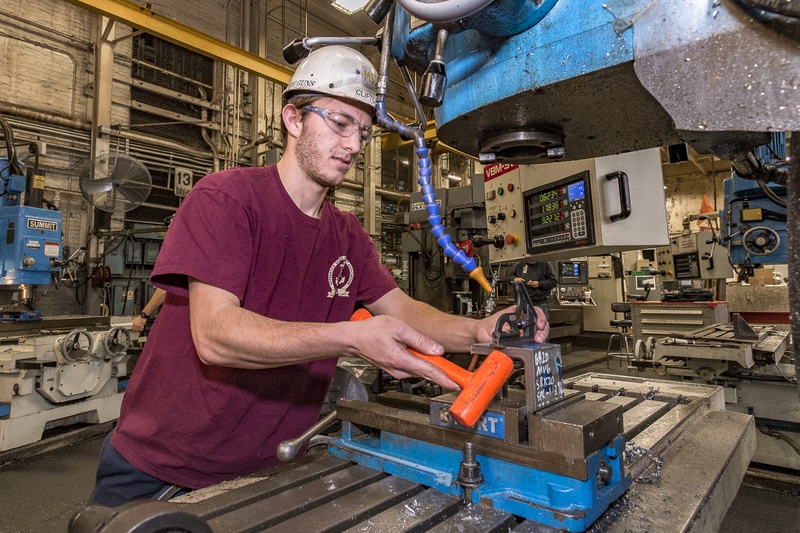 Shipbuilder Joshua Clifton sets up a drill press in the Machine Shop. On a crane, the familiar shade of “shipyard blue” stands out against a grey sky. Shipbuilder Nesburn Marsh uses a micrometer to get precise measurements in the Machine Shop. Newport News Shipbuilding’s new 315-metric-ton Goliath gantry crane arrives. The new crane will replace NNS’ 49-year old green Goliath gantry crane, which is currently above dry docks 10 and 11.